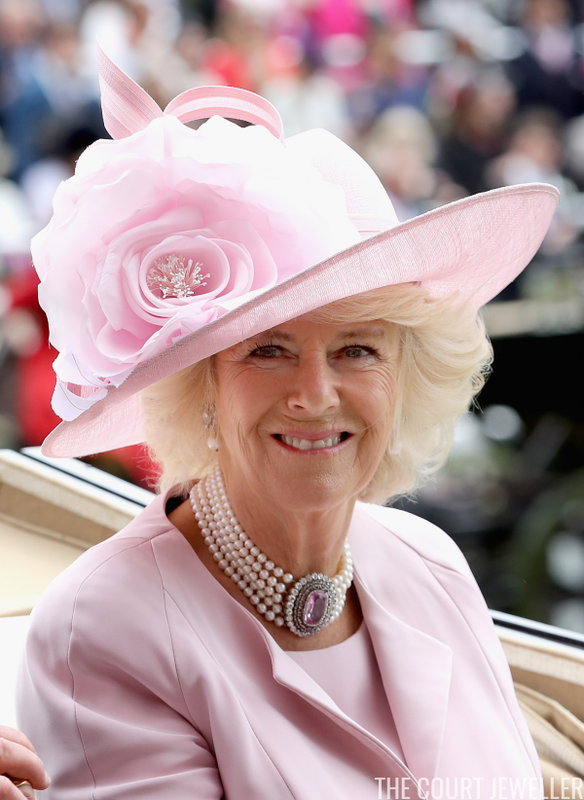 June is the month for celebrating the glorious, luminous pearl, and today we've got a bit of a pearly treat for you: a tour through the pearls in the Duchess of Cornwall's extensive jewelry collection. Here's a look at some of the examples we've seen her wear both before and since becoming a member of the royal family. 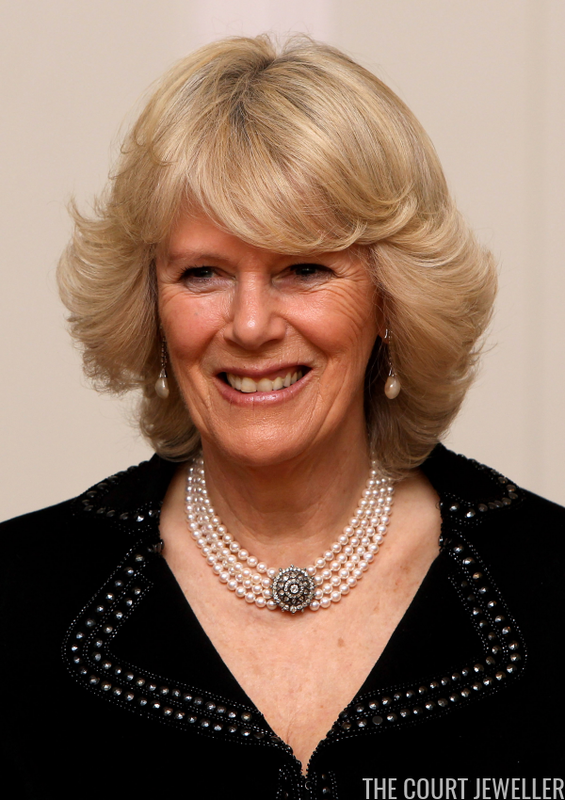 One of the pieces that Camilla has worn the longest is this necklace, which features three rows of pearls clasped together by a large aquamarine bordered in diamonds and gold. She reportedly inherited the piece from her late mother, the Hon. Rosalind Shand. 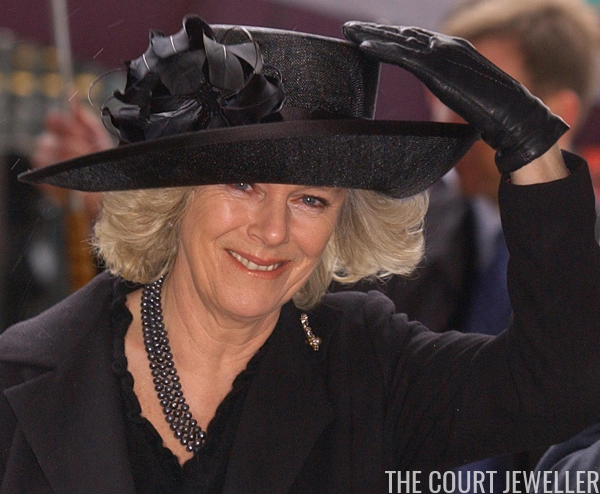 Although the clasp is elaborate, Camilla has worn it for both day and evening occasions, especially in the early years of her royal marriage. 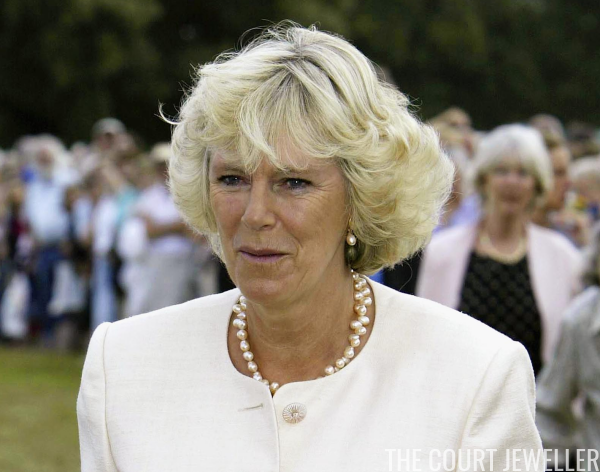 In the years before her royal wedding, Camilla got major use out of this choker, a three-stranded choker with a geometric clasp made of diamonds surrounding a single amethyst. 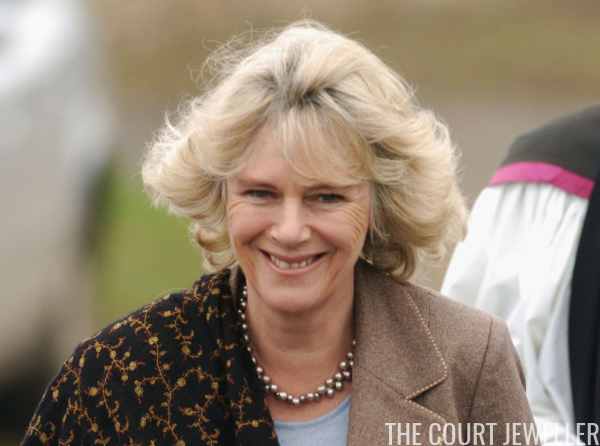 Camilla selected this necklace to wear at her very first official engagement: a visit to the National Osteoporosis Society in 2002. She also wore the necklace (plus an additional strand of pearls) at the Queen Mother's funeral. In February 2005, she wore the necklace on the night that her engagement to Prince Charles was officially announced. She continued to wear it often in the early years of her marriage. I'm guessing a bit about the gemstone that makes up the clasp of this three-stranded pearl choker. The six gemstones, arranged in a rectangular shape, look like very dark red garnets to me. Camilla wore this piece during the early years of her marriage to Prince Charles; above, she wears it in Scotland during their honeymoon. 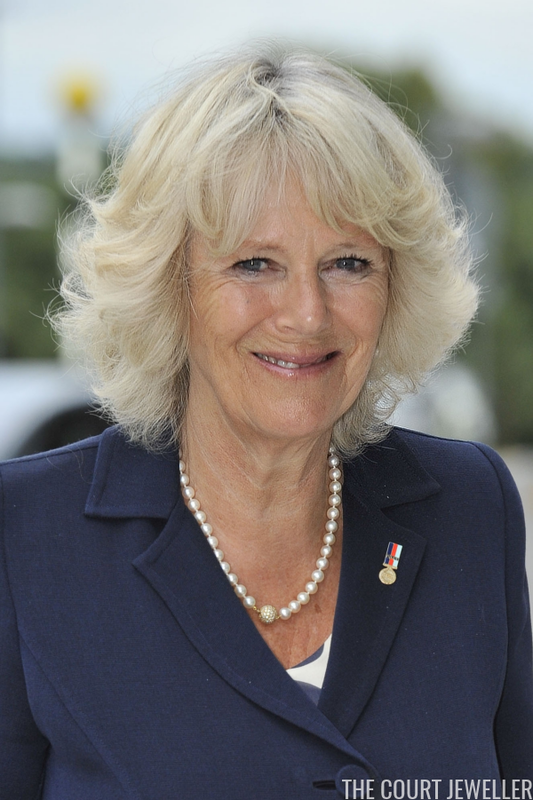 Camilla has worn this three-stranded pearl necklace, which has a large Art Deco diamond clasp, on numerous occasions, including a visit to Egypt in 2006 and in Cardiff the following year. The necklace comes from the collection of the late Queen Mother. This large necklace, which features five strands of pearls gathered by a large pink topaz and diamond clasp, is an antique (or the clasp is, anyway). Originally an Edwardian-era brooch, it was purchased at auction (possibly by Charles) in 2000. It also, intriguingly, had a matching pair of earrings. 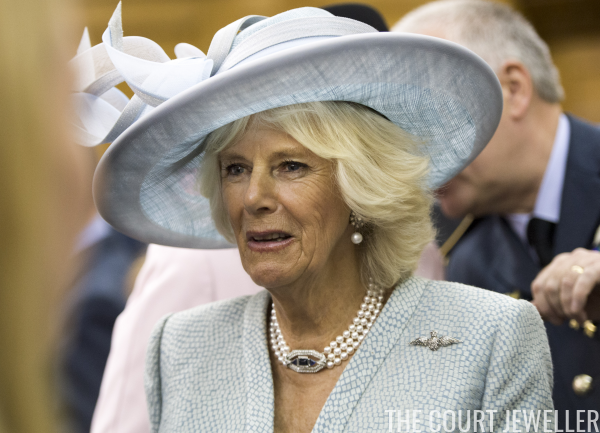 One of the absolute workhorses of Camilla's jewel collection, this necklace features four strands of pearls linked by a round clasp of diamonds in a circular pattern. These days, if you see her wearing a pearl choker at a daytime event, it's quite often this particular necklace. The slightly-larger cousin of the previous necklace is this one, a four-stranded choker that has a large diamond clasp with a cross pattern. 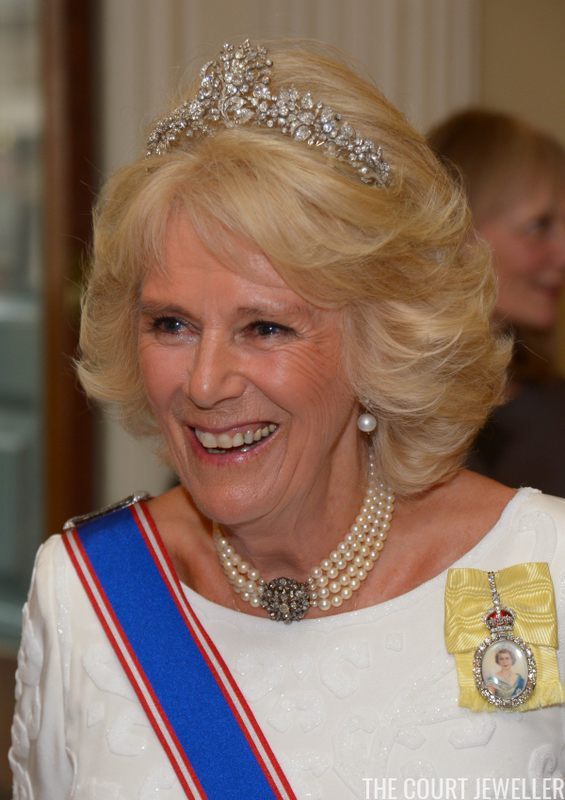 The intricate clasp makes it slightly fancier than the round diamond clasp necklace, and Camilla has begun wearing it at white-tie events, including occasions like the State Opening of Parliament. She also wears it for day occasions, including the christening of Princess Charlotte. 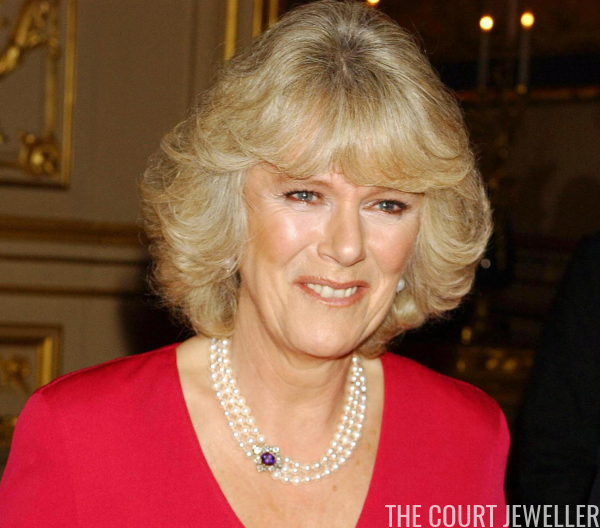 One of the newer additions to Camilla's collection is this sapphire and diamond Art Deco clasp, which is used to fasten a three-stranded pearl necklace. She's worn it a couple of times over the past few years, including a significant outing at Westminster Abbey for a Battle of Britain commemoration service in 2014. 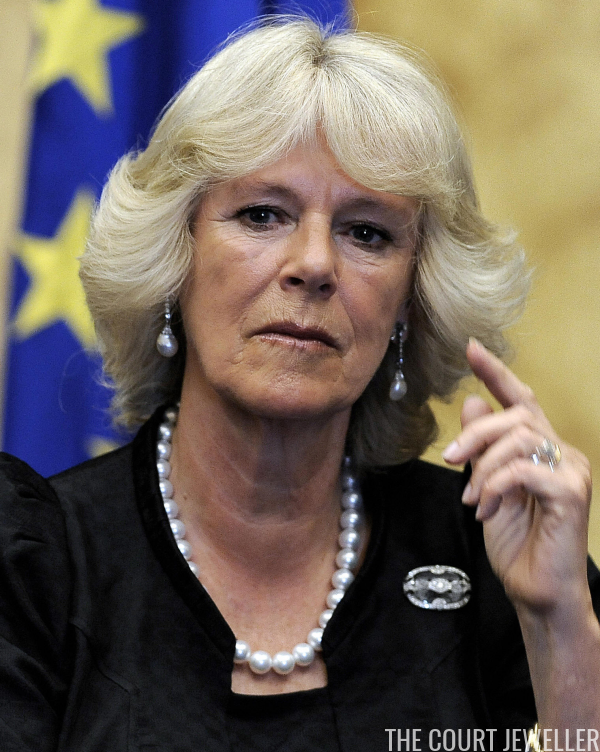 Camilla has recently begun wearing a new pearl necklace with a gem-set clasp. We haven't had great close-ups of the necklace, so it's hard to say precisely what gemstones might be included, but they appear to have a dark blue of violet hue -- so perhaps an amethyst, a sapphire, or even a tanzanite. 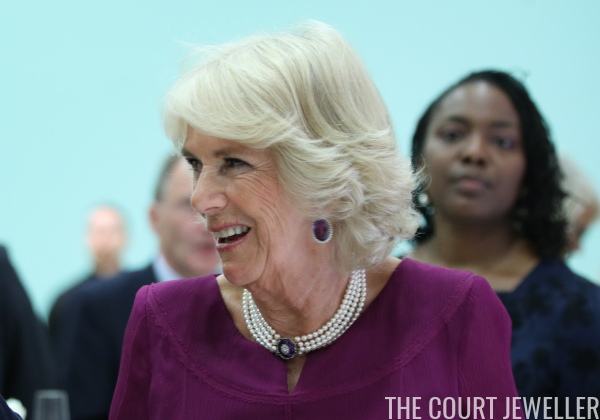 In May 2018, Camilla paired the necklace with amethyst earrings, which may give us a hint that the stone in the clasp is indeed also amethyst. This slender strand of pearls is a versatile part of Camilla's collection of pearl necklaces. She wears the pave-set clasp in various ways, both as a central element and off to the side. 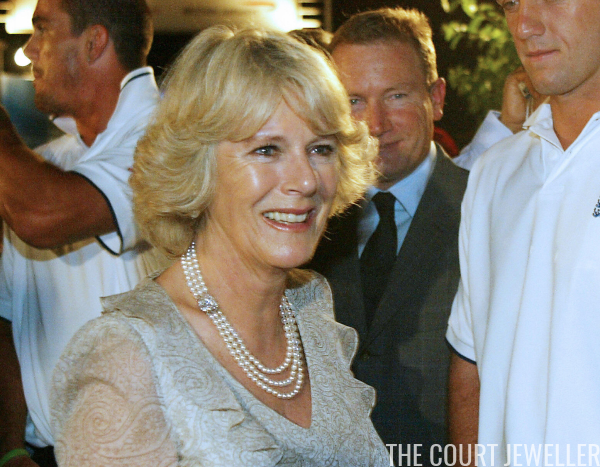 This lovely strand of luminous round pearls has popped up from time to time in Camilla's jewelry wardrobe, including a famous outing in 2009 during her trip to Italy and the Vatican. 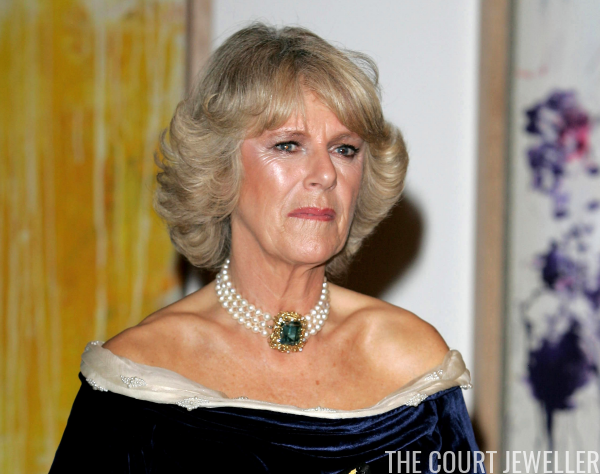 On that occasion, she paired the pearls with the Queen Mother's Rock Crystal Brooch. This lovely necklace of black pearls is one I'd love to see Camilla make more use of, especially at events of memorial or remembrance. In 2005, she wore the necklace at Westminster Abbey for a service of thanksgiving for the life of the late Sir Angus Ogilvy, husband of Princess Alexandra. 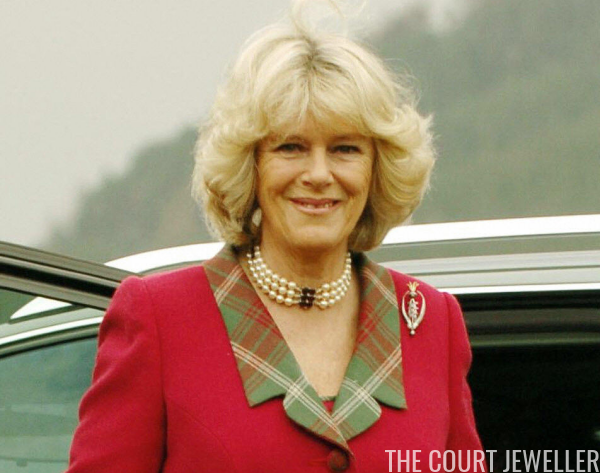 This lovely, modern necklace of silver pearls arranged in an offset pattern is one of my personal favorites from Camilla's extensive collection. She's been wearing it since before her royal wedding, and she's recently rediscovered it, wearing it for two recent engagements, including her visit to Northern Ireland. 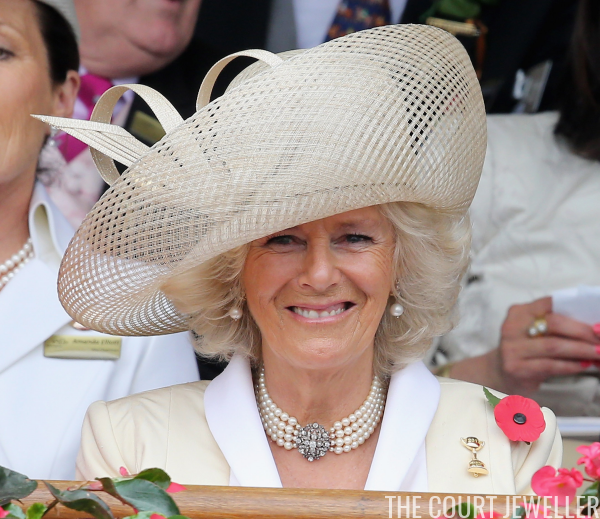 Camilla also has a version of her offset pearl necklace set with cream-colored pearls; it's been in her jewelry box since at least 2003. Note: This is an updated and expanded version of an earlier post, with new text and images.